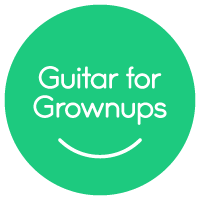 Music Together® Guitar Class for Grownups! The class is open to parents and caregivers of children registered in a current Music Together semester. If you would like to learn to play guitar using Music Together songs as the vehicle, this is the class for you! Participants will learn basic strums and chords for more than a dozen songs from the current Music Together song collection. This class is good for beginners who have never held a guitar, and good for people who know a little guitar. It's great for people who already play some Music Together songs! All participants build technique and musicianship in an organic, relaxed way while learning new ways to explore Music Together songs with their child at home and on the road. Plus, it's an enjoyable night out with other parents of small children. Course materials: You will need a guitar, guitar capo, 3-ring binder and a guitar tuner or pitch pipe. Here are a couple of places you can procure the needed guitar related items: Guitar Center at Colorado Blvd & Iowa or support local stores and head to the Folklore Center on Pearl and Jewell. Class schedule: Our one-hour classes are scheduled for eight weeks starting the third week of a 10-week session. Classes are held on Mondays and meet at 7:00 pm. Location: Our Wash Park Location at 1955 E. Arizona Ave. Contact admin@twinkletogether.com for questions or more information. Consider taking the class even if you've never played an instrument. It's a great way to continue the music-making at home, and you could be a guitar hero to your child!